Juba is one of the newest capitals in the world. It became the capital of South Sudan when that nation was declared independent on July 9, 2011. Juba, located on the White Nile River, is the largest city in South Sudan and in 2011 it had an estimated population of 372,410 people. Since then however the population has been growing rapidly as people from Europe, Asia, and the rest of Africa flock to the city because it is the commercial hub of South Sudan’s oil industry. It is also attractive as a crossroads for travelers moving between the Democratic Republic of the Congo, Kenya, and Uganda. Despite its status as a new capital city, Juba has a long history. Archaeological evidence shows the area has been inhabited since 3000 BCE. In 1862 Egypt established an army post near present-day Juba which served as the southern limits of that nation’s control over Sudan. Great Britain gained control of the region in 1899. In 1922 a group of Greek traders, who supplied British garrisons in the region, established the city. Soon afterwards rebels from North and South Sudan met there to declare a unified campaign to resist British rule. Even though their numbers never exceeded 2,000 people, from the 1920s through the 1940s Greek merchants controlled much of the commerce of the region, supplying goods for the indigenous people as well as the British. They built and operated the famous Juba Hotel in the early 1930s partly to accommodate air travel passengers since by that point Juba was a base for aircraft flying from Europe to Cape Town, South Africa. In 1947 Juba was the site of the Juba Conference which established the single colony and eventual nation of Sudan. Many in Southern Sudan, however, were opposed to that unification and began a civil war in the colony in 1955, a year before Sudan’s independence from Great Britain. That first Sudanese civil war continued until 1972. During the second Sudanese civil war (1983-2005) rebel leaders declared Juba the capital of the Autonomous Government of Southern Sudan. The second civil war ended January 2005 with the signing of the Comprehensive Peace Agreement (CPA) between Sudan’s central government and South Sudan rebel leaders. The CPA gave the southern region of Sudan autonomy for six years and a vote on its final status after the six years. 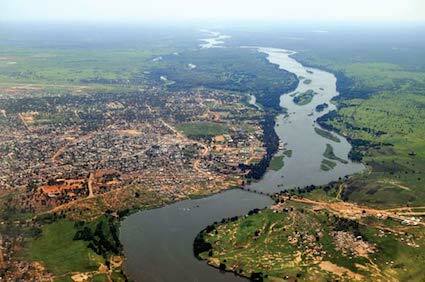 During this time Juba was the regional capital and in 2011 the region gained independence. The official language of Juba and South Sudan is English, although it is not the most popular or widely spoken language, with Arabic, Dinka, Nuer, Bari, Zanda, and Shilluk being spoken as well. The city has a mix of many different ethnicities and religions with Christians and Muslims as the largest groups. When Juba officially became the capital of South Sudan, it was a city ravaged by over a half century of civil war and much of its infrastructure was destroyed during those conflicts. Moreover internal differences between rival government factions, particularly over control of oil revenues, have put the city and nation on the brink of civil war again. Roman A. Cybriwsky, "Juba," Capital Cities around the World: An Encyclopedia of Geography, History, and Culture (Santa Barbara, CA: ABC-CLIO, 2013); “Juba,” Encyclopaedia Britannica Online, http://www.britannica.com/EBchecked/topic/307037/Juba; "South Sudan," Central Intelligence Agency, https://www.cia.gov/library/publications/the-world-factbook/geos/od.html.